In our dental practice in Berlin Charlottenburg, Professional Tooth Cleaning (PTC / GBT®) is the main component of our dental prophylaxis concept. Combined with regular dental controls it is the heart of our modern dental practice! The dental biofilm is the most important factor for the development of caries and periodontal as well as peri-implant inflammations. Periodontal disease can i.e. increase the risk of cardiovascular diseases, arthritis or diabetes. Good oral hygiene, combined with regular professional tooth cleaning keeps the biofilm under control and supports a better oral and systemic health. The world’s most modern procedure for your tooth preservation! First, the biofilm is visualized by applying a coloring solution. 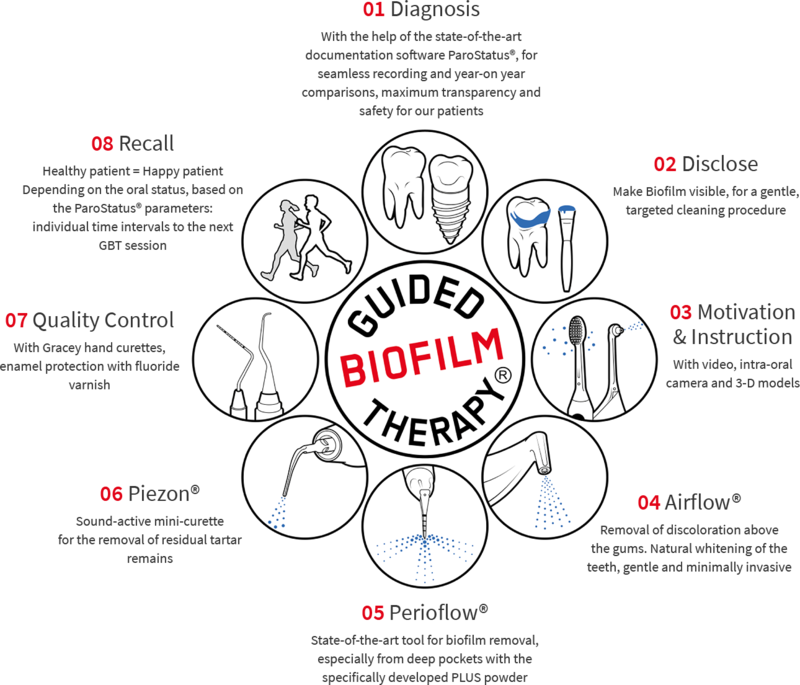 The method is referred to as “guided” because when cleaning the teeth and tissue the Dental Prophylaxis Assistant is guided by the visualization of the biofilm. Then, the pathogenic bacterial plaque is removed from tooth and implant pockets. This is done minimally invasive by Perioflow®. Young tartar is efficiently removed by special sonic and ultrasonic equipment and, if necessary, manually removed with a hand instrument. With this method the teeth, soft tissue, implants and restorations are cleaned safely, effectively and gently. The procedure can also be used successfully for prophylaxis in children and adolescents. Minimally invasive: The use of hand instruments, sonic or ultrasonic scalers is kept to a minimum. Better cleaning: By coloring and visualizing the biofilm, a targeted removal of the biofilm during the professional tooth cleaning procedure is controlled and a lasting reduction of bacteria is achieved. Pleasant: Effective biofilm removal even from deep pockets. Perioflow® has revolutionized conventional prophylaxis as a precaution against tooth and implant loss. Systematic tooth cleaning clearly goes beyond your daily oral care at home. Regular professional tooth cleaning is recommended by the German dentist association. It should be carried out every six to twelve months by trained specialists like Dental Prophylaxis Assistants or Dental Hygienists. Though, the best individual interval is influenced by various factors. Tooth decay and plaque are the most common form of tooth damage The teeth can be damaged by them even at a young age. As the decline of gums and bones increases at older age, it becomes more noticeable, especially if existing tartar is not regularly removed from deeper pockets and interdental spaces. Then even a thorough oral care at home does not help to prevent periodontitis (bone and tooth loss). Furthermore, the removal of tartar and bacterial plaque significantly brightens your teeth. Therefore PTC / GBT® performed by Dental Prophylactic Assistants or Dental Hygienist is not only recommended to improve your oral health, but also in terms of aesthetics and natural colour restoration. Modern dental prophylaxis has developed significantly in recent years, for the benefit of patients. In our family practice in Berlin Charlottenburg dentistry is offered at the highest level. On a continuous basis we invest in the best equipment and in the training of our specialists: Nicole Tafelski, Manuela Riechers, Nadja Wagener and Nazanin Taimourian are looking forward to welcoming you.